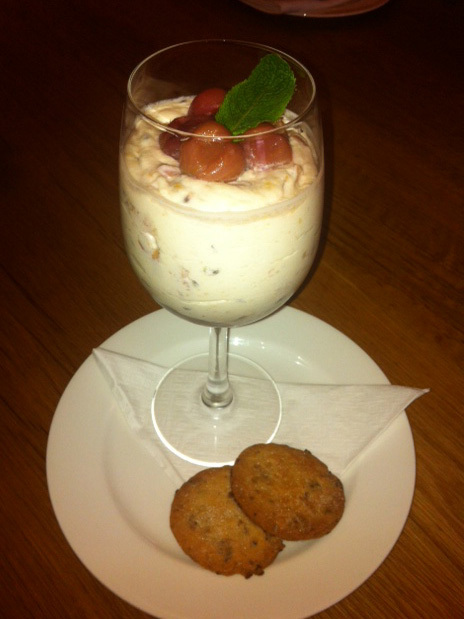 This recipe for gooseberry fool was given to us by John Riddleston, the Head Chef at The Green Room Bistro in The North Hill Hotel, Colchester. The creamy-yet-tart dessert is delicious served with homemade shortbread. Top and tail the gooseberries, put them in a roasting dish with the vanilla pod and sprinkle with sugar. Roast in a hot oven (200C) for 15 minutes. Remove the gooseberries from the oven then drain in a colander, saving the liquid. Put three quarters of the cooked gooseberries in a food processor. Scrape the vanilla pod and add the pulp to the fruit. Add the yoghurt to the mixture and blitz. Place a small spoon full of remaining whole gooseberries in the bottom of a large wine glass; then spoon on the fruit and yoghurt mixture. Garnish with more of the remaining whole gooseberries and mint.